Hollybeary Creations : YNS April Release Blog Hop! YNS April Release Blog Hop! 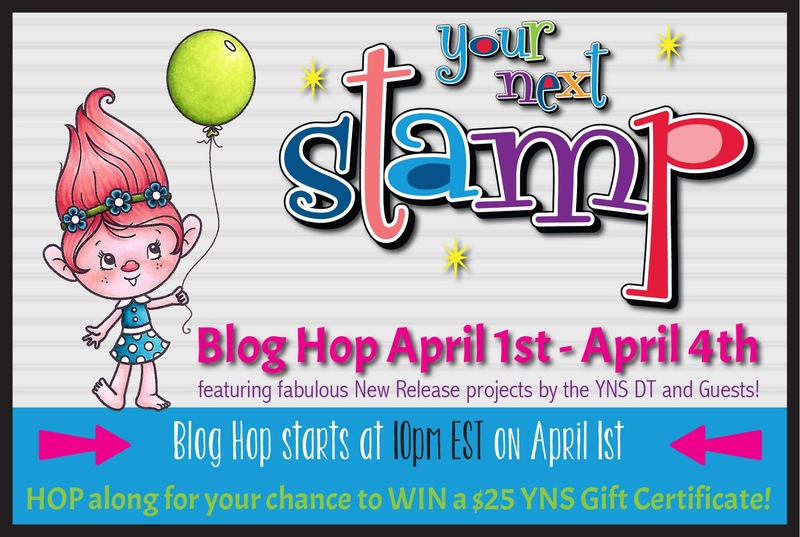 It's time for the YNS April Release and Blog Hop. This release has something for everyone! I'm sharing projects made with the new set Once in a Chameleon and Coffee Chicks! I used some Distress inks to create a panel and then I die cut it using the Crazy Shapes Panel die which is also from the release. Then I cut a second panel from some White card stock and used the colored shapes inside. I colored the Chameleon with Copic Markers to make the Greens I used on the background. And I added some of the new Enchanted Forest Gumdrops in the Olive color. My second project uses the new Coffee Chick set, Bold Alphabet Dies, Cool Tags Four Die set and the Crazy for Coffee 6x6 Paper Pad. I created a background with some Distress Oxide inks to look like spilled coffee and then I used the Bold Alpha dies to create a shaker area. 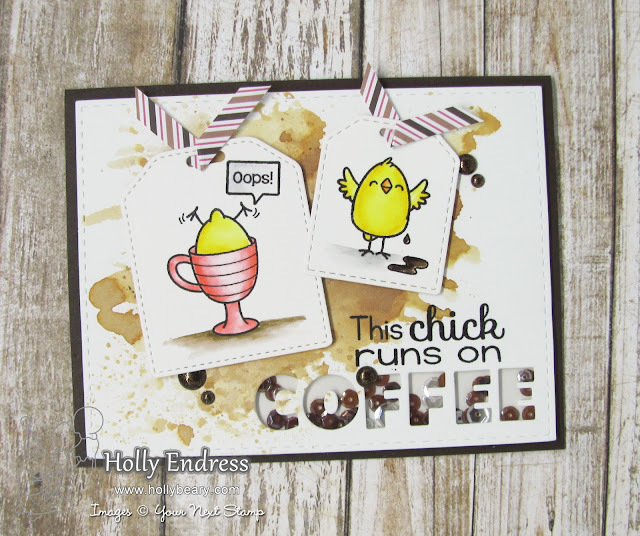 I stamped the chicks from the Coffee Chicks set onto some tags die cut from the Cool Tags Four Set. Then I used some of the Crazy For Coffee Paper to create ribbon for the Tags. I wanted a bit of Sparkle so I added some of the Chocolate Gumdrops from the new Enchanted Forest Gumdrops set. Hope along with us and leave comments for a chance to Win a $25 GC to the Store. There's also a great sale in the store for you to stock up on your Favorites!! Such awesome cards! Your backgrounds look amazing on both! I enjoyed your video earlier today too! I love the coffee card! The background is wonderful, but the way you used the Alphabet dies for a shaker card makes it just the best! Thank you so much for the inspiration! Really cute cards. Love the coffee shaker card. Holly you are genius, making a shaker with the alpha die. WOW. That chameleon is so cute used with that cover die! I love the face on the chameleon (& "Peace" is my favorite word!). drink!). L*O*V*E both of your darling cards. Great cards! love the new sets..
LOL, how cute are THESE? Love them Holly! Both cards tickle me, love them! Super cute cards! I especially l love the first one because green is my favorite and that background is so fun! I love your cards! Great designs and I love the fun Coffee details on your Coffee Chick card like the stain and the shaker bits that look like beans! I like both cards, but especially the Chameleon one. It put a smile on my face. Thanks. These cards are really cute! I love that lizard! Holly that chameleon card makes me giggle out loud! Love the funky shapes behind him! Your coffee shaker card is pure genius! Love your peace out card! He's adorable! Your peace dude card just brought a smile to my face. So very cute. Then you scroll down and see your coffee card, OMG!!!! Absolutely love both your cards. Great release. Cuteness all around, the chameleon is adorable and matches the green background so well. and the chick n coffee shaker is clever made Holly..
these are fun! love the chameleon! Great cards!Very creative and clever! Oh, these are so cute!!! And I just LOVE that adorable chameleon!! Your cards are adorable! I love the backgrounds on both cards! Gah, so CUTE. I bought both of those fun sets, thanks for the inspiration! Great background on the first card and I like the shaker element on the coffee card. Both cards are adorable, Holly! Loving the attitude of the Chameleon. Great cards. Love that chameleon. Cute cards. That chameleon is just adorable! The chameleon card made me laugh! What a great sentiment and I love how you put these elements together! Awww!!! Adorable cards!!! Too cute!! in the egg cup. Cute card. Cool cards! The little chicks are adorable! I love that Chameleon card with the Crazy Shapes Panel. Added to my list of wants. Oh my goodness I just love the attitude on that little chameleon. Great cards!! Love that cool chameleon and the super fun chick card, too! That chameleon reminds me of Pascal from the movie Tangled! Cute! I really like how you made the word Coffee into a shaker area! Awesome cards! Love the new dies and stamps, both of which you showcased brilliantly! I love your cards so much!! I love all the products you used on your coffee card! !